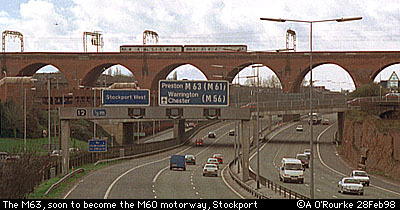 Home Page of the author Manchester is to get its own orbital motorway - the M60. Well, most of it is already there, but under different names - the M62, M63 and the M66, the final stretch of which is currently under construction. This "missing link" should be completed by next year, but the � job of changing all the signs will start immediately. So if in future you're told to "take the Worsley interchange onto the M60 and keep going", you could be in for a long journey! Peel Holdings, owners of the gigantic Trafford Centre (opening later this year), have come up with a scheme to build a Metrolink tram line to the new centre without any cost to the taxpayer. A new Metrolink line across Trafford Park will improve access for people working there, especially out of hours, and should attract more businesses. Trafford Centre bosses have stressed that they want to make the new centre accessible to people who don't have a car, as well as those who have. There's currently an extensive recruitment campaign, including radio ads, for people to work at the centre. First Bus, the company which operates most of the services in north Manchester, has launched a scheme to revamp bus services here, as well as in Leeds and Aberdeen. They have put up �m and have challenged the government to provide a similar amount, much of which would be spent on new buses. There's also a billboard campaign around the city, one featuring a bus that can ride on water. If the New Labour Government plans to put another 20 or so pence on a litre of petrol come to fruition, we might all be forced back onto the bus, at least that's the theory. Better, more comfortable, more reliable and more frequent bus services and more Metrolink lines is the answer, in my opinion , oh, and the reintroduction of two man operation, just like in the old days (an unlikely prospect). If you're not too far from Manchester Airport and fancy a Concorde hop over to Toronto, you can depart at 10am on Tuesday 26th of May, and on 8 July, 5 August and 14 September. After a five night stay you fly back by Air Canada 767. The cost: �99. The last time I saw Concorde at Manchester Airport was when I worked there 16 years ago. And a group of Canadian tour operators have been visiting Manchester and the North West this week. It's part of a plan to cement links between Canada and here. At the inquest into the helicopter accident in Cheshire last year in which millionaire Matthew Harding, and the other occupants died, it was found that the pilot had somehow become "disorientated". He had been in contact with air traffic control at Manchester Airport, but had somehow lost track of his position. A verdict of accidental death was recorded. 40 years ago, a plane carrying businessmen from the Isle of Man crashed on Winter Hill, with the loss of 35 lives. The accident was remembered at local church services yesterday. The City Art Gallery will have its extension earlier than originally planned. The Gallery has a large collection, but can only display a small proportion of it. The extension will be built on the area to the rear, currently used as a car park. There's currently a fascinating display of paintings by French art professor Adolphe Vallette and his pupil L S Lowry, probably Salford's most famous painter. Valette painted atmospheric scenes of Manchester around the turn of the century, and Lowry was active in the 20's and 30's and up to his death. And on Saturday and Sunday night, a new musical based on the 19th century novel "The Manchester Man", was staged at the Cathedral. Entertainment of a different sort won't be on offer at comedian Bernard Manning's Embassy club in Harpurhey. Councillors have rejected the application to allow "lap dancing" at the club on the grounds it's situated residential area. There was also opposition from local residents. In the city centre, there are a few clubs featuring scantily-clad dancers, so I've heard, but Manchester has a long way to go before it becomes another Bangkok or Las Vegas. A new swimming complex on Oxford Road will have an extra pool. The complex will be one of five "High Performance Centres" and will be used in the 2002 Commonwealth Games. The stadium site in Bradford, east Manchester looks like a wasteland at the moment, but work should soon start on the new stadium. Yes, Manchester will certainly be full of exotic visitors in 2002, and is already attracting them: The latest arrival to make the news is a four foot long Cape Cobra who slithered into the luggage of a local visitor to South Africa. The snake hitched a 6000 mile ride back to Manchester, and was only discovered when the holiday maker arrived home in Mottram, started to unpack, and the new arrival reared up and hissed at him. The RSPCA were called out and said that the snake was one of the most dangerous species, and could kill. The reptile has been taken to a sanctuary. Venom of a different sort was spouted by "bad-boy" Burnage expat Noel Gallagher, of Oasis last week. He caused controversy and outraged tabloid headlines with his derogatory remarks about Princess Diana. The band were rude and disruptive on a flight to Australia recently. Personally I prefer the manners of up and coming Moss Side girls Cleopatra, currently in the top 20 with their first hit, also entitled "Cleopatra". This week's weather was a mixture of overcast skies and drizzle, interspersed with sunny periods. 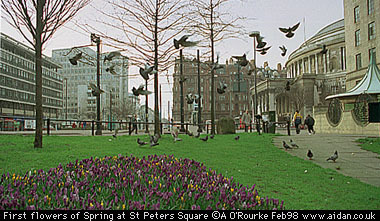 The last days of February 98 turned cold though national temperatures for the month were the warmest since 1869. Cold northerly winds caused snow to fall on high ground. Saturday was cold and sunny with huge billowing clouds over south Manchester. 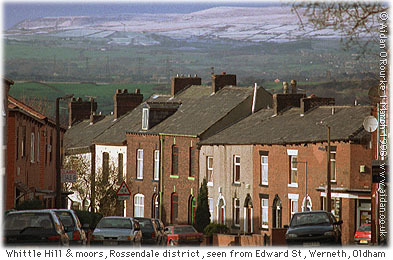 Sunday was more overcast, and I managed to catch up with the snow above Littleborough. The Countryside Alliance protest march takes place in London under the slogan "listen to us". G,DAY JOHNNY HERE IN AUSTRALIA , I USE TO LIVE IN MANCHESTER BACK IN 67-77 AND REALY MISS THE PLACE , TRYED TO FIND 'IN TOUCH' IN THE NEWS BUT FAILED ANY WAY GREAT SITE AND RAN OUT OF TIME TRYING TO GET THROUGH IT , IVE LIVED AT: GORTON /REDDISH/WHALLEY RANGE/BLACKLY (WHEN MY DAD HAD THE ALLIANCE INN) BODDINGTONS OF COURSE, STOCKPORT/ASHTON UNDER LYNE/DENTON/AND WHYTHINSHAWE/. HAVE FOUND A FEW FREINDS ON THE NET (BUT) I THINK WE NEED MANCHESTER CHAT. SOME WHERE PEOPLE FROM MANCHESTER OR IN MANCHESTER, CAN CHAT AND MAYBE FIND FREINDS IN , OR , FROM MANCHESTER. IF YOU KNOW OF ANY SITE LIKE THIS ID LIKE TO KNOW , I VISIT V, MANCHESTER EVERY SECOND NIGHT AND WILL BE BACK HERE AS WELL . THANKS..JOHNNY. Well I guess we got no response regarding the Manchester gentleman on the Titanic, nor did anyone know where Frank Swift's body was laid to rest. Sad, sad! I took some pictures in Sale recently. I'll try and include them. I have three "Then & Now" pictures taken in & around Altrincham. I used to live in Didsbury on Palatine Road but am now living in Australia. The newsletter is great for keeping up with news from home and your photo collection is top for nostalgia but I can't find any pictures of Didsbury village, ie. Wilmslow Rd, or nearby area anywhere. Do us a favour and stick a few in your collection or in the newsletter or let me know where I could find some. Much appreciated and keep up the good work. I came accross your excellent web site whilst exploring the Manchester web for somewhere to take a group of colleagues for an evening out. 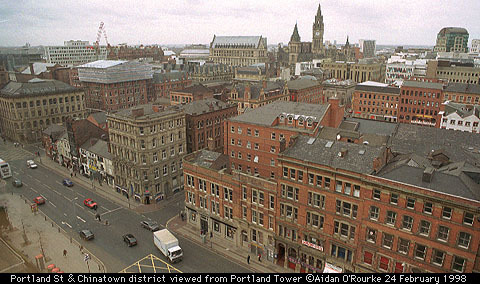 Being Manchester born and bred (1949) I have witnessed impressive changes in Manchester as it emerged from post war/ post industrial decline. Some of the photographs available invoke strong memories - my late father was a volunteer fireman at the time of the Manchester Blitz (before he was called up for active service) and remembers watching 'his' building burn down because his hose pipe could not pump water high enough. I still have in my possesion a fairly large brass bell which he recovered from the rubble of the blitz (school bell?) which used to hang in the porch of his house. You also have a photograph which, I think, is of the shops on Stockport Road, Longsight, at the junction of Stockport Road and Slade Lane. I used to live in the side road off this junction, Portland Road. The shops have changed usage substantially from when I was a boy. (The view of Lyme Park near my home is now my pc 'wallpaper'! Hmmm, the one of the shops is in Rusholme, I think. I haven't taken one in Longsight. Glad to hear that whether in the furthest reaches of Canada or Australia or a few miles down the A6, people are looking at my photographs of Manchester!